This entry was posted on Friday, May 4th, 2018 at 2:16 pm	and is filed under Products I Like (or Don't Like), Rhubarb. You can follow any responses to this entry through the RSS 2.0 feed. You can leave a response, or trackback from your own site. I think I hate rhubarb. Well, I know I hate rhubarb. But I have faith in your ability to come up with ways to fix the beastly vegetable that will change my mind. I will be ordering a copy. (Not sure the rhubarb pizza will do the trick, but did you say cocktail? That might just hit the right notr😉). 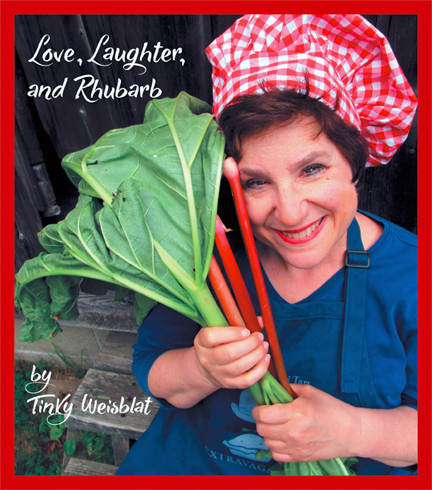 Congratulations on finishing your new book, Tinky! I think the pizza will work for you, but I know you have to ease into it. Thanks Grad. Did I tell you that your father’s dandelion salad (as best as I could interpret it) is in there?